Artist’s rendition of Dragon spacecraft with solar panels fully deployed on orbit, courtesy of SpaceX. Dragon’s solar array panels being installed on Dragon’s trunk at the SpaceX hangar in Cape Canaveral, Florida, photo courtesy of SpaceX. ....will use deployable solar arrays as its primary power source for running sensors, driving heating and cooling systems, and communicating with SpaceX’s Mission Control Center and the Space Station. Dragon’s solar arrays generate up to 5,000 watts of power — enough to power more than 80 standard light bulbs. The solar arrays, shielded by protective covers during launch, deploy just minutes after Dragon separates from the Falcon 9 second stage, as it heads towards its rendezvous with the Space Station. While many commercial satellites and NASA missions such as the Hubble Space telescope use solar arrays, Dragon will be the first commercial American transport vehicle to do so. 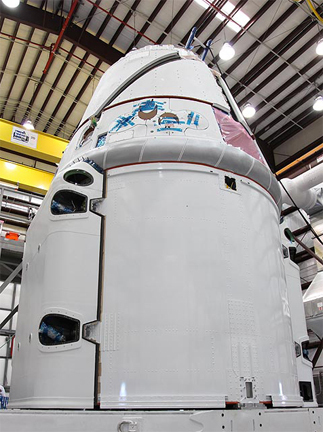 Dragon with the protective fairings installed over the folded solar arrays, at the SpaceX Cape Canaveral launch site. Past American spacecraft such as Mercury, Gemini, Apollo and Shuttle used fuel cells or battery packs. Fuel cells are limited by the amount of chemical reactants (typically oxygen and hydrogen) that the vehicle can carry. Batteries alone are limiting due to their mass and the amount of power they can carry. Solar energy provides a key benefit — long-term power. Combining Dragon’s solar arrays with a compact and efficient battery pack provides a reliable and renewable source of power. When in the sun, Dragon’s solar arrays recharge the battery pack, and the charged batteries provide power while Dragon passes through the Earth’s shadow. With solar panels, Dragon will have the power it needs for longer trips, whether to the Space Station or future missions to Mars. Dragon’s deployable solar arrays were developed from scratch by a small team of SpaceX engineers. To ensure they will survive the harsh environment of space, our engineers put the solar arrays through hundreds of hours of rigorous testing including thermal, vacuum, vibration, structural and electrical testing. After testing was complete, the solar arrays headed to SpaceX’s Cape Canaveral launch site for final integration. 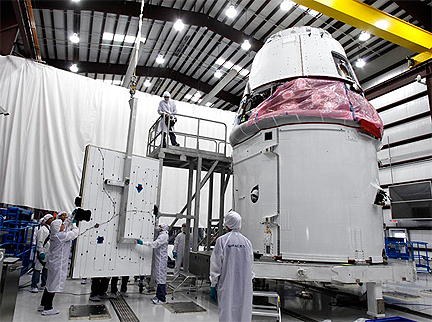 The solar arrays and fairing covers that protect the folded arrays during launch have since been installed on the Dragon spacecraft in preparation for their first flight to the International Space Station. Company information.